On December 10, 2018, a meeting of the Сhief Council of the “Scientific Lviv” was held. According to the results of the examination of applications submitted for the competition, 10 Lviv scientists received awards from the Lviv City Council. Among them – candidate of physical and mathematical sciences, associate professor of the Department of Theoretical Physics Volodymyr Pastukhov. On December 23, 2016 in the Lviv City Council the winners of the «Lviv City Mayor’s Award for Talented Scientists» under the «Scientific Lviv» program, were «awarded. Among 10 talented scientists – the head of the Department of Theoretical Physics, Professor Volodymyr Tkachuk. In 2016, the project “New nanomaterials based on ZnO for optoelectronic and sensory devices”, associate professor of the Department of Solid State Physics, candidate Physics and Mathematics Sciences Borys Turko won the competition for projects of scientific works and scientific and technical (experimental) developments of young scientists working (studying) in higher educational and scientific institutions that belong to the management of the Ministry of Education and Science of Ukraine. International academy of astronautics has awarded Ukrainian scientists for the best book in the sphere of fundamental sciences. 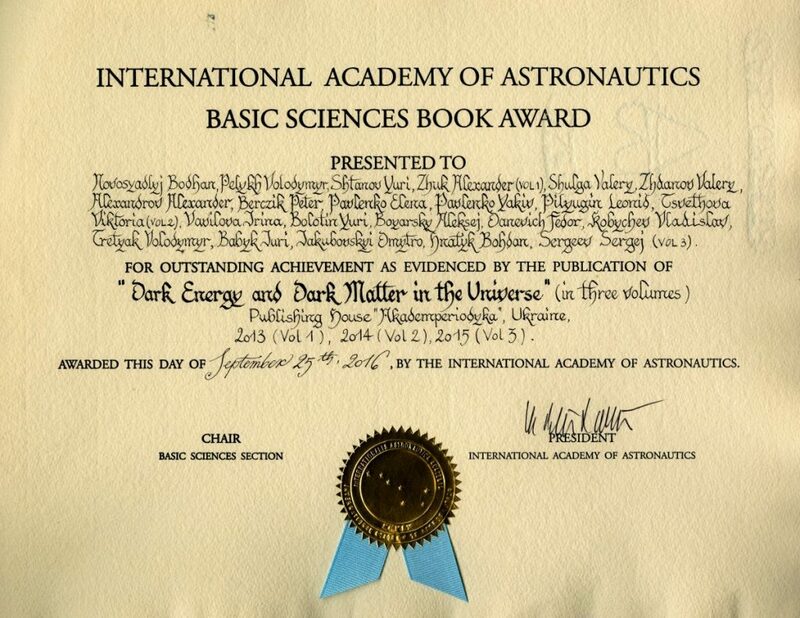 International academy of astronautics, which was founded in 1960 under initiative of one of rocket building pioneers T. von Karman, presented their award of 2016 in the category : “The best book in fundamental sciences field” to the authors team of scientists from Ivan Franko national university of Lviv (Bohdan Novosiadlyi) of a three-volume edition “Dark energy and dark matter in the Universe”, Pidstryhach Institute for Applied Problems of Mechanics and Mathematics National Academy of Sciences of Ukraine (V.Pelekh), Bogolyubov Institute for Theoretical Physics (Yu. Shtanov, O. Boyarskyu, D. Yakubovskyi), I.I.Mechnikov National University (O. Zhuk), Institute of Radio Astronomy of the National Academy of Sciences of Ukraine (V. Shulha, V. Tsvetkova), Taras Shevcheno national university of Kyiv (V. Zhdanov, O. Aleksandrov, B. Hnatyk, O.Pavlenko, S. Serheiev), National Science Center “Kharkiv Institute of Physics and Technology” (Yu. Bolotin), National Academy of Sciences of Ukraine “Institute for Nuclear Research” (F. Danevych, V. Kobychev, V. Tretiak) and National Academy of Sciences of Ukraine “Main Astronomical Observatory” (P. Bertsyk, Ya. Pavlenko, L. Piliukin, I. Vavylov, Yu Babyk). The monograph was published in the period of 2013-2015 in the series “Ukrainian scientific book in foreign language” of the publishing house “Akademperiodyka” of National Academy of Sciences of Ukraine.